Most things I make with the Vitamix I blend until they are completely smooth, but pesto is something where it’s best to leave some texture. Basil is prone to oxidation, so it’s good to minimize how much it is blended. This is where the variable speed control is particularly useful. Pesto is a perfect complement to a summer meal, and if you make a big batch you can freeze it and have it all year long. I usually do pesto by eye, but in writing this I looked up Bittmann’s recipe in How to Cook Everything Vegetarian. Note: If you have a G-Series Vitamix with wide container, you’ll need to make a bigger batch, probably double this recipe, (or you can get a smaller container to use with your machine). I don’t add any salt because the Parmesan is salty enough for my taste. I lightly toast the pine nuts. I usually do it with a toaster oven at ~300 F for ~5 minutes. Just keep a close eye on them and take them out once they start to darken a bit. If you’re starting with a block of cheese I recommend grating it in the Vitamix before starting the recipe. You can blend chunks of cheese at the same time as everything else, but I’ve found that that can lead to over-blending of the basil in order to get the cheese sufficiently blended. To grate Parmesan just put chunks of it in the pitcher and blend on high for about 10 seconds. You do not need the dry blade container for this, although you’ll want to make sure the inside of the container is dry before adding the cheese. 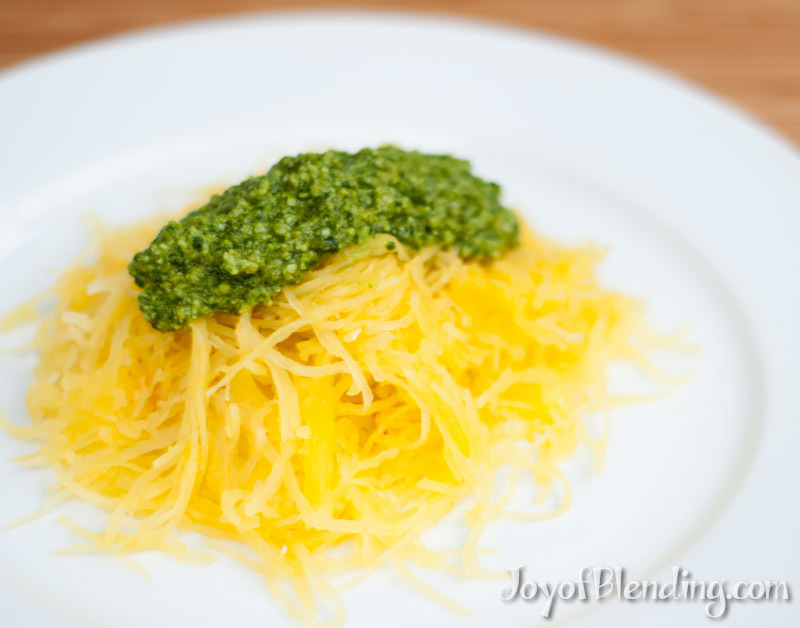 Dump out the grated Parmesan and put the other ingredients in the blender. Start at variable speed 1 and then slowly ramp up to variable speed ~5. 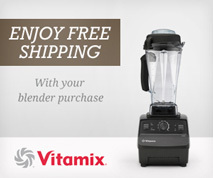 Keep blending until you get to the desired consistency (20-30 seconds), but try not to over-blend it. When basil is oxidized it looses its delicious flavor, so it’s best to leave it in small intact chunks rather than totally blending it to like you would a smoothie, which would expose more of it to the air. At the end add the grated Parmesan and briefly blend to incorporate it. In my experience if you have any leftover pesto it is best to freeze it, even if you’re going to eat it the next day because it loses its flavor in the fridge. In the freezer it keeps for many months. I freeze it in individual servings: I either use ice cube trays and transfer to a freezer bag once frozen, or I make little satchels using plastic wrap and put those in a freezer bag. This time I didn’t feel like having a big pile of pasta, so I had the pesto with spaghetti squash instead. I was a bit short on time so I cooked the squash in the microwave. There are many ways of cooking spaghetti squash, but this is my current method. Jab the squash a few times with a knife, then put into microwave whole. Cook for about 10 minutes, and turn it over midway through. Depending on the power of your microwave, once you start to hear it hissing you can turn the power down to medium for the rest of the cooking time. When it’s done you should be able to poke into it with a fork, but note that the skin can be a bit tough, even once the squash is done. I once overcooked one because I was waiting for the skin to be soft. Be careful not to burn yourself on the steaming hot squash, and cut it in half. Scrape out the seeds with a spoon and discard (or toast them and eat them). To get the “spaghetti” out, scrape it with a fork, and serve. I’ve found that scraping the seeds out after cooking is slightly easier than doing it beforehand. If you have any leftover basil (unlikely, I know), you can try a refreshing basil smoothie. *Use one of the traditional wet blade containers if you have it (I do not, but am seriously considering the 32 ouncer after making this). Unless you double it, this recipe is small for the Next Gen containers–I had to repeatedly stop the machine and manually move the ingredients back within range of the blades. On the plus side, this made it easy to avoid over-blending. *Variable Speed 2 is plenty fast on these machines for this recipe and it doesn’t fling the ingredients out of range of the blades quite as quickly.